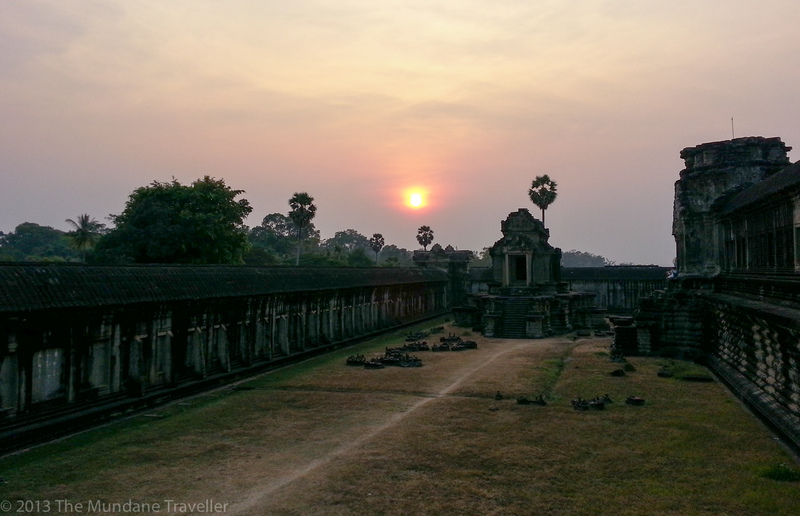 At the end of a full, hot day in the ancient Khmer Empire visiting the so-called “Small Circle”, there it was – sunset in the world shaking Angkor Wat. The biggest surprise is that this photo is not taken with my high-end SLR! What happened? I have lugged 2.5 kg of heavy equipment through three countries with the intentions to take high quality pictures of the largest temples of the world, but in the end I used something so far from a SLR that it made me almost cry not to be able to use it. Having endured the heat of the day, loosing at least 2 litres of sweat, I damaged one of my precious Nikkor lenses (my beloved 35 – 70mm / 2.8) and emptied the battery of my fall-back compact camera Olympus XZ-1 1.8 in the process. Two weeks before, in the jungle of Laos, I dented the filter ring of my Tokina 11-16 mm / 2.8 lens. So at the end of this day I was left with nothing more than the camera of my mobile phone, a Samsung Galaxy Note II. This proves the photographers common phrase again – “the best camera is the one you have at hand”. Looking at the picture, the result is not so bad at all! Not perfect but with a certain impact. Judge for yourself! The quality of light available to you. Photography is “drawing with light”! So the better the light quality the better the result. The framing of the photo according to tell about the topic / story, i.e. your artistic feeling or techniques to transfer your emotions into a picture via technology. At a very late stage comes technology, i.e. your camera and your technical skills about how you use the technology at hand. No matter if it is a film or digital, SLR, compact or even mobile phone, no technology can substitute a good story, told with the help of the three points above. In this case Angkor Wat at sunset is a good topic and an easy take – but sure you can make mess this one up if you are focusing too much on technology and don’t know what you are doing artistically. Sunset is the natural lighting at its best only matched by a great sunrise early in the morning. I only focused on framing, the rest of the techniques were relatively out of my control as I used my smart phone, which nowadays have very advanced software built-in to interpret a scene. I nearly never do post-processing but here I modified the colour dynamics slightly using Adobe Lightroom 4. In the end you need to know how to use your camera and how to use those techniques to express the story you want to tell. But with which technology you do it, doesn’t really matter in the end. Even with a camera of your mobile phone you can take fascinating pictures as long as the three above prerequisites are fulfilled. Update 17. January 2013: I have managed to use my Tokina 11-16mm with a defect filter ring, just in time with the Sunrise at Angkor Wat! Check out that blog entry too.